Today I’ve decided to share a few of the Eiffel Tower’s beauty secrets. How does the century-old glamazon manage to keep her good looks? Maybe it’s Maybelline or perhaps it’s the 2.5 million rivets holding together the 20,000 square meters of intricate iron latticework. Never a mess, don’t hate her because she is still beautiful. Doll back the clock: Oblong and ruler-straight from shoulder to hip, the Eiffel Tower was built in 1887 by visionary architect Gustave Eiffel (the Couturier in Iron!) to serve as a showstopper at the Exposition Universelle. On inauguration day, Monsieur Eiffel signed an adoring female visitor’s fan with the inscription: “The French flag is the only one with a 300-meter pole.” Mais oui. The Eiffel Tower’s colossal measurements are more than impressive. Rangy and long-limbed, the 1,046-foot-tall stunner stood heads above the other structures on the planet from 1889 until 1930. 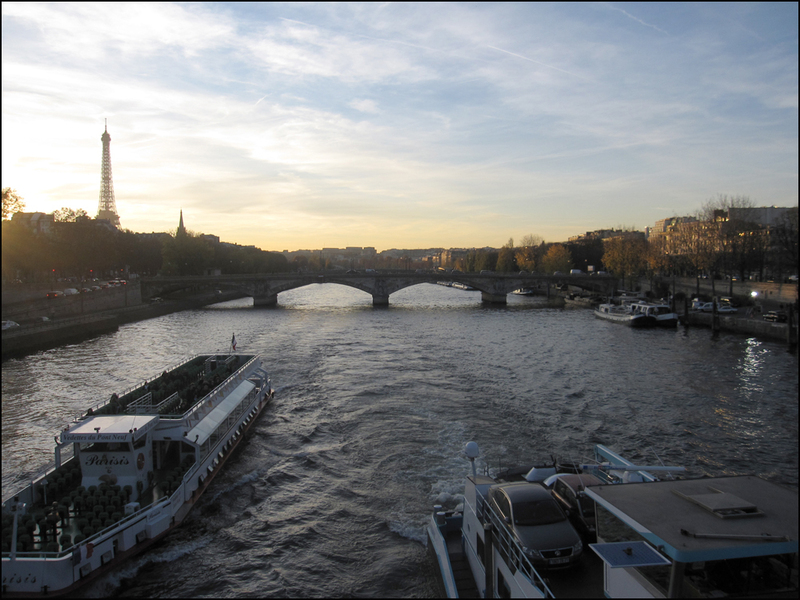 Her shapely 620 foot “gams” rely on their curvaceous geometry to carry the wind pressure so she doesn’t topple over into the Seine on a blustery day. So take cover! Wind, the dominant natural force affecting her, is strongest at the top, but most of it blows through her and not against her because of her airy wrought iron. Well, almost! She has been known to jiggle on a gusty day—but only a few inches. Although crease-proof with a steely core, such constant change can wreak havoc on the complexion. More tidbits: Painters must follow traditional methods, which haven’t changed since her débutante days. Paint must be applied manually, with brushes and rollers. Leave the paint guns at home. Lastly, work may not start until each morning’s dew has evaporated. Now that’s a spa-worthy treatment! Like the moon and stars, the Eiffel Tower is a free show from almost anywhere in the city, but better yet go there at least once. Just do it! Looking for a picture-perfect shot? Shoot up from below, center stage. Here the tower’s iron lattice resembles classic French black lace knickers. Oh, la la. Le Mur pour la Paix (The Wall for Peace) is another favorite spot. 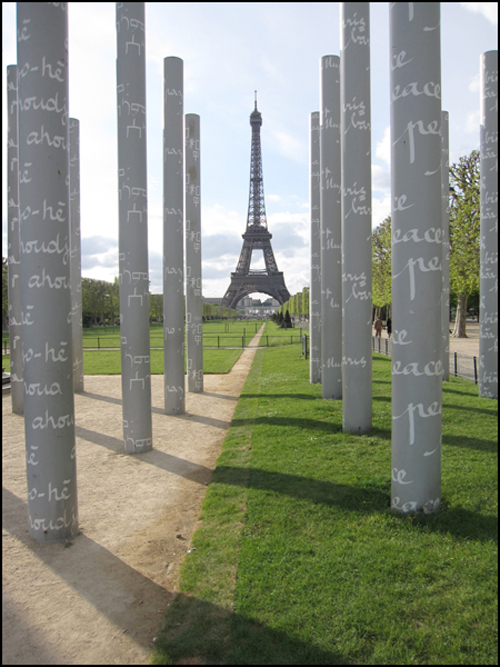 Located on the southeast end of the grassy Champ de Mars (near the École Militaire), it was created in 2000 by artist Clara Halter and architect Jean-Michel Wilmotte. 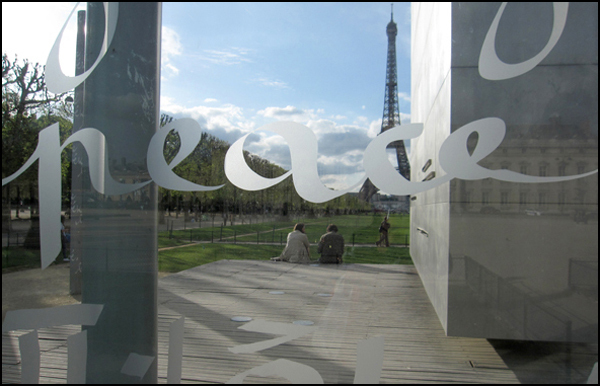 The word “peace” in 49 languages is inscribed on large glass panes and tall, slender metal columns. 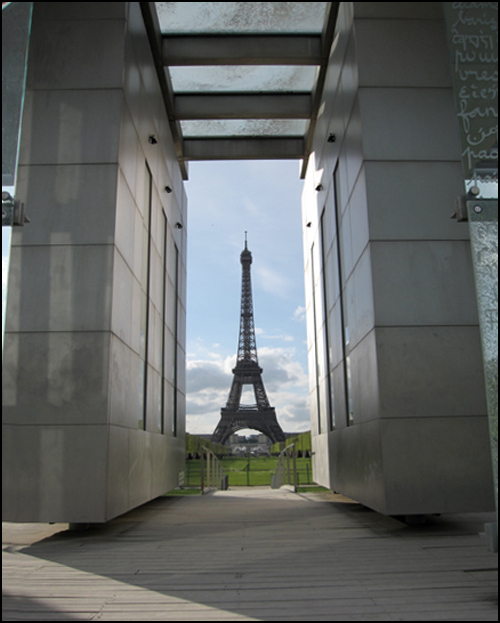 Gaze up at the Eiffel Tower through the monument’s glass panels, and try not to feel a bit more mellow. Where is the love? Trust me, it’s here. Tips: For optimum viewing, the glass and metal play nicely against the soft late afternoon sun. Also, advance tickets are now available online. Life is groovy! Oh I wish I had that compact. Lovely as always, T.
As always, thanks for your lovely words!! Yes, I have a mad penchant for collecting compacts. 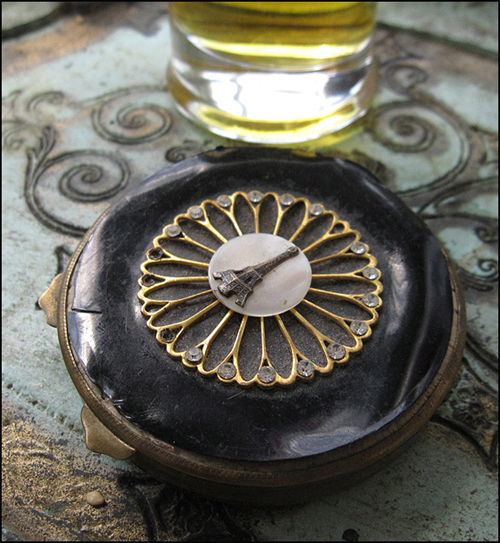 For the love of mana, especially the well-loved ones with little dents, scratches, and traces of powder and rouge. Oh, if only they could chitchat. Short story material?! T.
Yes, the Eiffel Tower is an iconic darling! Hard to believe she was once called an “esthetic misfit,” a “tower of Babel,” a “hollow chandelier,” and a “torturing nightmare.” Ouch!! T. Funny!! Parasites, indeed!! I loved your recent and oh, so clever “What does it mean” (Alternate Meanings of Words) post at Tales and Travels of the Tinman. “Parasites, noun. What you see from the top of the Eiffel Tower.” I’m still giggling. Big hugs!! 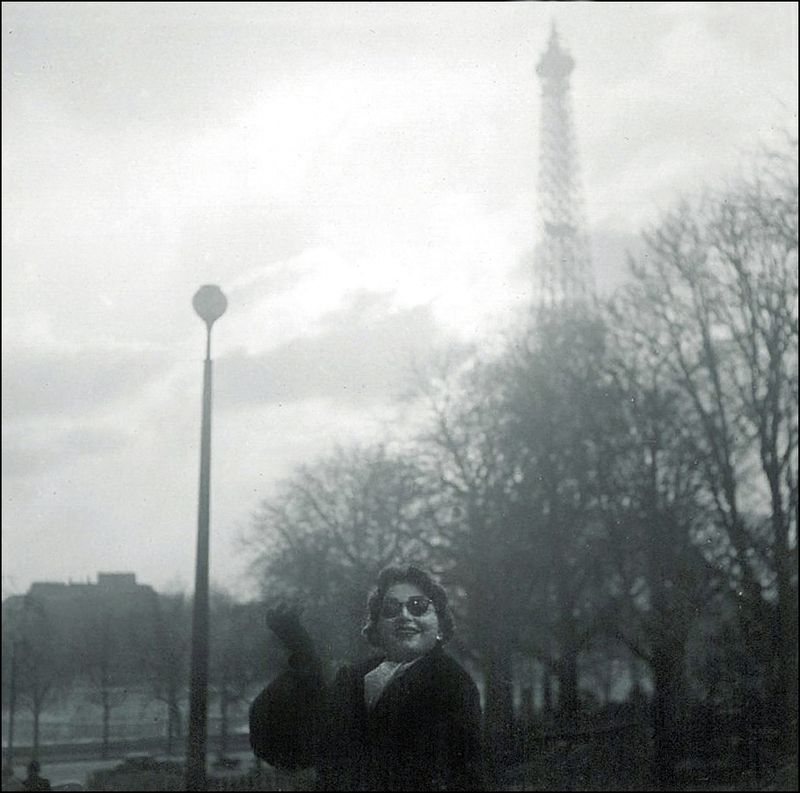 T.
Very nice – Love Paris! Wonderful Post! Can’t wait to see it in the fall! Yes, add the Eiffel Tower to your list! According to the Tower’s PR guru Marthe, there are no “slow days” at the Tower. Perhaps in January! Marthe recommends buying advance tickets online. Have you started to pack?! T.
Not yet! Watching the on line tickets. We will buy them before we come, but last I checked, we were too far out. I reckon it probably is the Maybelline 😉 Great post! During the two World Wars, she was not painted. Fabulous, as always, darling. Your words must be divinely inspired. They graciously take up space across a page so perfectly. Pray tell: more about the “my prayers platters” and, who, I’m embarrassed to ask, are the Herrings? Sadly, I’m not acquainted. Carry on! Thanks, Anita!! “My Prayer” is a wonderful song. I get weepy every time I hear it! Here’s the scoop! 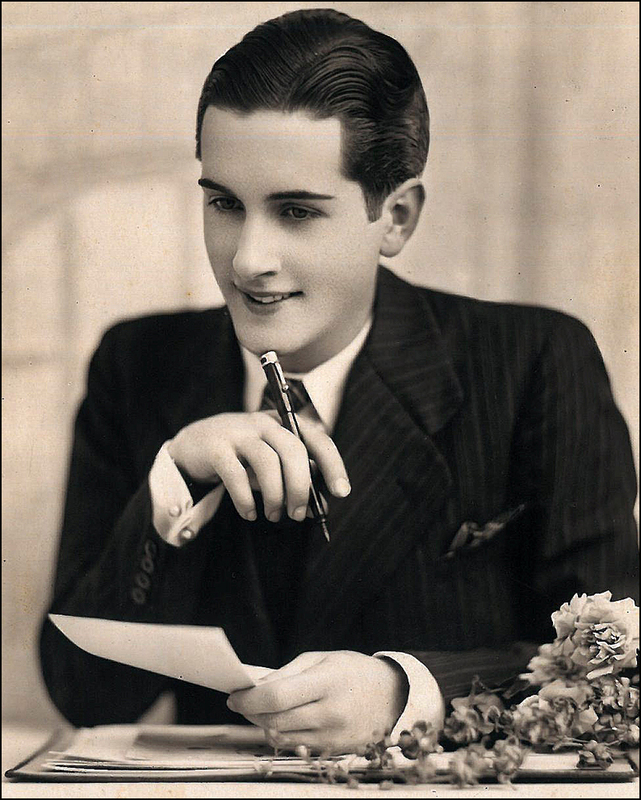 It was written in 1939 by violinist Georges Boulanger and Jimmy Kennedy. (By the way, Kennedy wrote the slightly creepy “The Teddy Bear’s picnic!) 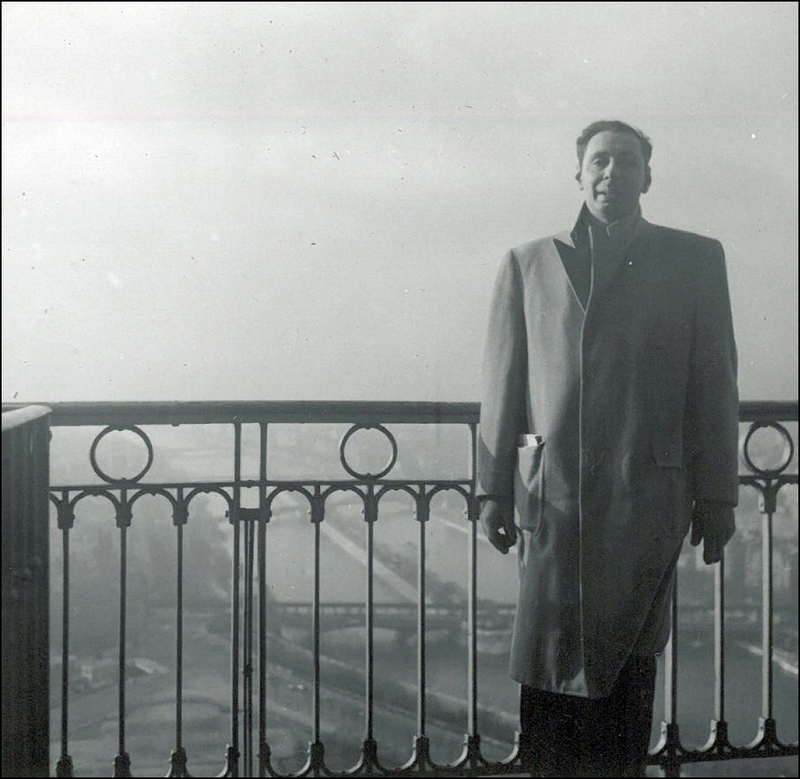 Boulanger’s composition was originally called “Avant de mourir.” In 1939 it was covered by the Glenn Miller Band and the Ink Spots, and then by the Platters in 1956. It was the number one song in the US in August of 1956. Let me know what you think of it. Don’t forget the hankie!! T.
I’m still on the hunt!! T.
I was soooo waiting for this one. and not a disappointing micro second! I have some sort of romantic notion about this tower…one day, one day I will stand there. I have an absolutely beautiful photograph of it that my brother took for me when he was in Paris last year…it’s one of my favorite things. Thanks T…loved it! Thank you, Rhonda!! Have you found your brother’s photograph? Let me know if you post it! The Eiffel Tower is a beauty. It wasn’t an easy, breezy journey! In fact, it wasn’t until the 1930s, after enduring years of endless ribbing that she found herself in the good graces with the world. Better late than never!! T.
absolutely. and i’d love to post it…i don’t have a story to go with it tho, ’cause i’ve never been. but it’s a beauty. Never knew about the three different shades of paint as you go up the monument. Interesting! Thanks, G.!! I dig the Eiffel Tower uniforms created by designer Jean Charles de Castelbajac. The smart-looking ensemble in olive and bright orange includes pants, a jacket, a blouse, a scarf, a hooded jacket, AND a matching purse! T.
Hey “T”–Your words were great but your pictures are an “eye-full”–as usual! Thanks! Hey M.! Thanks for your words, sir. T.
Thank you!! Here are few more home, er, tower improvement tidbits. The redo requires 25 painters working for 15 months with 1500 brushes and 5000 sanding disks, while wearing out 1500 sets of work clothes. Now that’s a lot laundry! T.
Thanks, as always, for the wonderful post! Tip! Photography at Ladurée (while waiting in line to purchase macarons) is strictly forbidden. If caught, they scold you like there’s no tomorrow. This is why I now buy my macaroons at Gérald Mulot! They embrace social media and free publicity. Plus, the staff is friendly and the macarons are less expensive. Beautiful photos. I had no idea the tower had been red and even yellow! We have a family photo on the tower from when I was about five I am guessing. I think I will have it blown up and framed. It is stuffed away somewhere. How odd. As always, thanks for your swell words!! Let me know if you find the photograph. I’d love to see it! Flashback! Here is a listing of the Tower’s colors. (I also sent it to Rob below.) I love the “secret formula” numbers. So mysterious!! T.
Oh cool now I know what color it was when I visited since I don’t have the slightest memory of it! 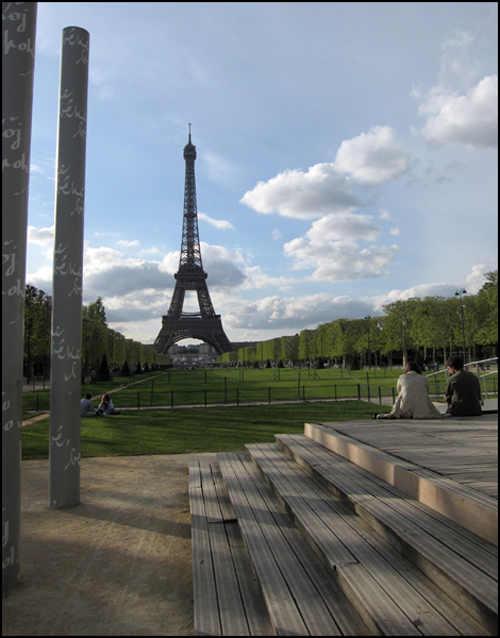 Love it – you know I never get tired of looking at La Tour Eiffel! 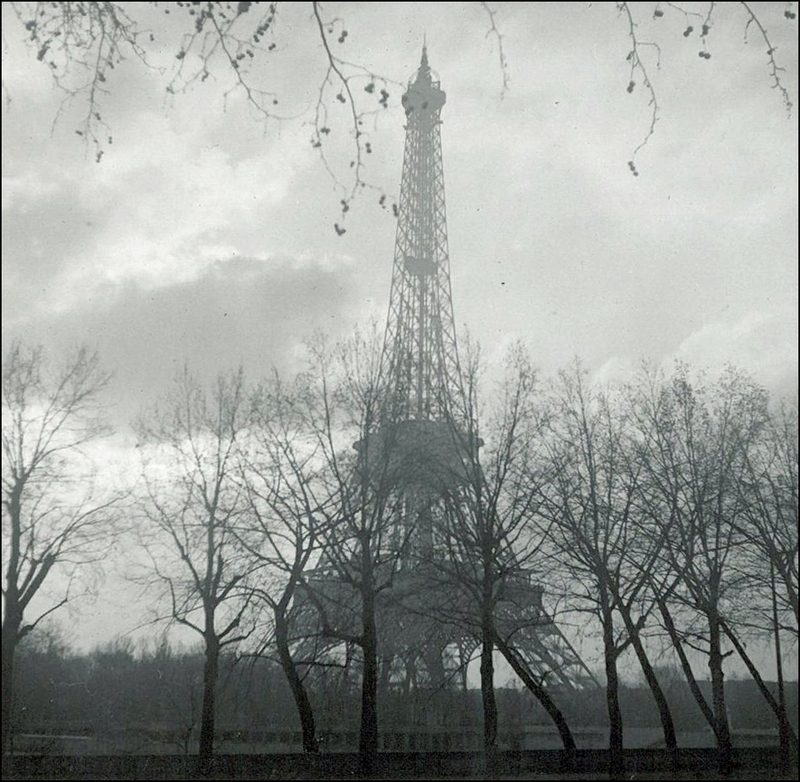 The vintage shots are amazing, they make me want to step up my photographic game the next time I’m in Paris. Thanks, Krista!! You always post such fabulous travel illustrations on your site. 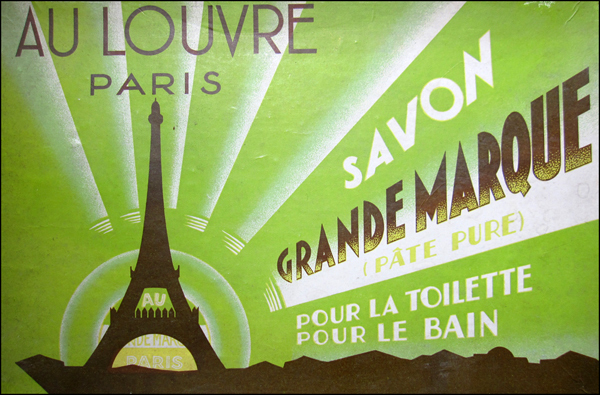 I’ve just started collecting travel posters by French illustrator Roger Broders during the 1920s and 1930s. Reproductions, of course. He was a genius. I’m now on the hunt for the book: Voyages, avec Roger Broders: Affichiste des annees 20-30 (French Edition) by Annie de Montry. It’s a beauty! T.
Sounds marvelous – we all need more vintage travel images in our lives! Krista! Do you have a favorite travel poster illustrator? T.
I don’t, but I really enjoy the more geometric colour ones from the 1960s. It made travel look impossibly glamourous. Such an inspiring post with Eiffel in so many angels!! Fab! Ah, thank you!! I’m now off to check out your artsdevivre boards. I bet they are pretty darn fab. Enjoy the weekend! And Bon Anniversaire!! T.
I can’t wait! 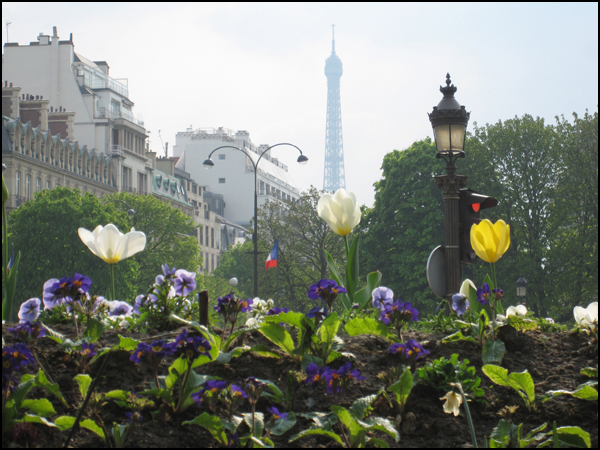 I leave to visit Paris and Normandy July 1-8! Super excited. Thanks for the post! Not yet but I bought a bunch of clothes to wear! I’m nervous that I’m not fashionable enough for Paris! Haha! So excited! I always “nest” my suitcases. That way I end up with an empty suitcase for my bargain bin clothing purchases!! T.
Well it was a fabulous trip! I can’t even tell you what my favorite thing was! There was so much! I climbed to the top of the Arc de Triomphe. That was such a beautiful view! I saw Mont Saint Michel, Notre Dame Cathedral, Sacre Coeur, Versailles and of course, the Louvre. It was amazing. AND now I’m addicted to macaroons. I’m so glad they don’t sell them here because I’d be so fat! Thanks for the fab trip report!! I also love the views from the Arc de Triomphe!! (Did you make it to their sweet gift shop?) And the macarons. Oh, I am still hooked! They’re so pretty and photogenic. I’d like to make my own one day. And tour the Gérard Mulot factory!! T.
Thank you! I am in LOVE with the buildings there and taking photos of them. Didn’t make it to La Rochelle. Looking at pictures, it is quite beautiful. Honfleur was VERY rainy the day I was there so I didn’t get much of a chance to explore. We ate dinner and then it was time to leave. The photos I got were the few I snapped while walking to the restaurant in the rain. They came out very nicely though! No, I don’t remember the name. It was raining pretty hard for a while there so the umbrella was definitely needed at times. No light drizzle, more like a downpour but then it stopped and a nice rainbow came out! Thanks again! I always love the experience of reading your posts. You allow me to feel like I’m in the romantic city of Paris. I have a deep seated love of French living that I don’t acknowledge enough, though I do have an Eiffel Tower room in my house. Tomorrow I’m finally going to start a CD collection of very basic French lessons because I’ve always wanted to learn learn French, which I believe is the most beautiful language in the world. Thank you for inspiring me to stay connected with this part of myself! Sensational article! Thank you for such insights, wisdom and lessons. My sister in law has 8 replica models of The Eiffel Tower, the largest is over 4 metres tall, needing a special room to house it. The rest are up to a few metres tall, and adorn some of her studies, family room and living rooms. That is well and good, but Paris and the many human wonders built there are tonic necessary every few years I find. It is just great to be there, go to the bakery or bar, and the 2nd time you walk in, usually the following day, your coffee is server without only a glance of the eyes as bon jour cheerfully greets you. Love those photos from 1956…fabulous! This was a fun post to read, especially since I have never been to France. Now I have visit. Wonderfully researched blog! Thank you very much. Some unusual and lovely shots of the tower here.